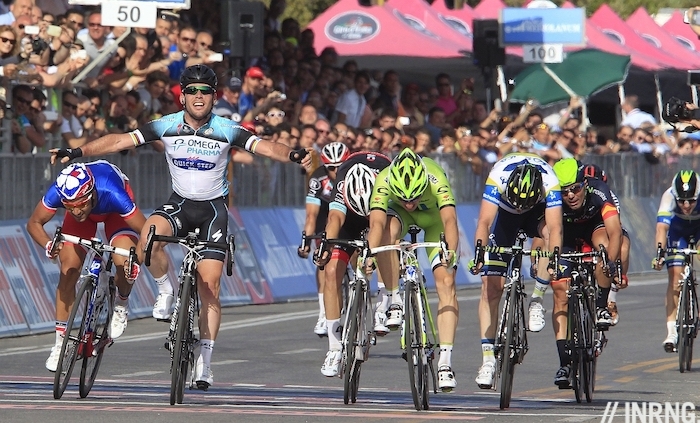 A straight battle between Mark Cavendish and Peter Sagan? That seems to be the settled view. But how does the route suit each rider and what of other contenders? The more you look at the 2013 Tour route, the more chances Mark Cavendish will have but if he’s good, he’s got plenty of competition from others. The Tour de France is arguably the only race of the year where we get to see all the top sprinters in competition. Points are awarded on the finish line and the single intermediate sprint. Crucially more points are available at the finish for a flat stage than a hilly one. On a flat stage the first three get 45, 35 and 30 points with points down to 15th place whilst on a hillier stage the first 15 get points too but with 30, 25 and 22 for the first three. And on the mountain stage there are even fewer points available. The intermediate sprint offers 20 points for first place with again points for the first 15. The full scale and the stage rankings, aka “coefficient” is listed over at inrng.com/tour. If there is addition, there is subtraction too. Ask Matthew Goss who was docked 30 points after switching in the sprint. Note the bias towards pure sprinters. In practical terms a finish for Mark Cavendish earns more points than an uphill finish for Peter Sagan. In total there are eight Coefficient 1 stages with maximum points for the green jersey whilst only three Coefficient 2 and 3 stages. Mark Cavendish is my choice for green. Given the number of pure sprint finishes, the extra points available and a strong team he is the prime pick. He’s also a rider who seems to be improving every year, I’m impressed by his athletic ability whether in team time trials or the ability to finish the Giro when he could have gone home mid-race. Already in fourth place on the count of Tour de France stage wins he should add more wins and take home the green jersey. The Omega Pharma-Quick Step team is very strong on paper, especially if Tony Martin and Sylvain Chavanel are deployed to control breakaways before Niki Terpstra, Gert Steegmans and Matteo Trentin work as the boosters on the sprint rocket to launch Cavendish. Peter Sagan won last year and is another obvious pick. It was so easy last year he was planning his victory salutes in advance with a committee of friends. But this year’s route is less suited to him. He will need to score points in the bunch sprints, to top-up on the hillier days with stage wins and mop-up the intermediate sprint points on a mountain stage or three. Sagan’s problem here is that if he can be fast enough to win bunch sprints it’s easy to imagine Cavendish and Greipel beating him. 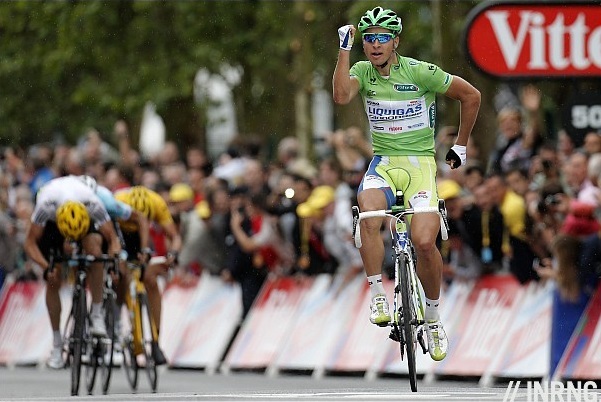 Plus there aren’t many Sagan-esque stage finishes where he can win whilst the pure sprinters are dropped. He could score in Corsica but by the time Stage 14 to Lyon arrives, the GC will have big time gaps and a breakaway is likely to go up the road, it’s hard to see Cannondale contain the race and besides, the finish might not even be tough enough to drop the likes of Cavendish. This isn’t to write him off, just that he’s got fewer chances this year. The contest should be more than a duel. Peter Sagan was well ahead last year whilst Mark Cavendish was fourth in the points standing. André Greipel was second and the new German champion is one of the few riders who can beat Cavendish, we saw this in the Tour last summer. Missing last July was Marcel Kittel. He was in the race but whilst his rivals were applying themselves, stomach problems meant he was applying the brown chamois cream. He’s got the pure speed – he beat Greipel and Cavendish in the recent Ster ZLM Tour – and comes with a dedicated team, including John Degenkolb where it will be interesting to see how the pair work. 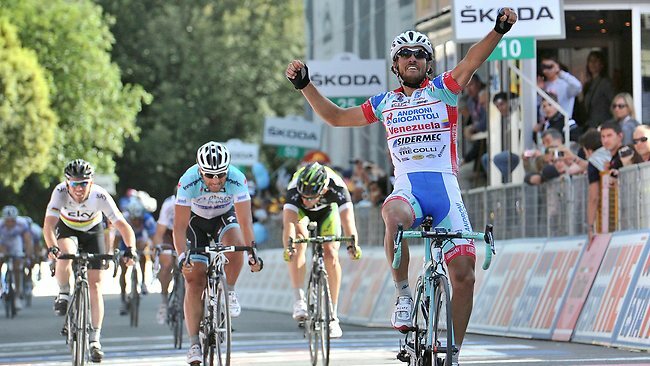 Degenkolb copes well with uphill finishes and won five stages in the Vuelta last year and one in the Giro this year. Matthew Goss has to come good sometime. But he’s won fewer races with Orica-Greenedge in 2012 and 2013 than he took with HTC-Highroad in 2011 when he was the team’s second sprinter to Mark Cavendish (and John Degenkolb was there too). But if the wins have not been prolific, the points are and he’s a regular in the top-5. Another outsider is Katusha’s Alexander Kristoff, a fast-finisher who is only getting better and the Norwegian is versatile for the uphill sprints too. Compatriot Edvald Boasson Hagen is worth a mention, he’s likely to be on team duty although a stage win is possible. Now perhaps you might not think of Goss, Boasson Hagen or Kristoff as green jersey contenders but they can spoil the ambitions of others. A stage win for Boasson Hagen could come at the expense of Sagan. So all these names mean points are spread across a wider mix than the Slovako-British duopoly. We’ll also see others sprinting. FDJ bring Nacer Bouhanni for his first taste of Le Tour and he’s proved able to win big but has yet to become a peer of Cavendish and Greipel. Lower down the pecking order come Tony Gallopin (Radioshack-Leopard), Boy Van Poppel (Vacansoleil-DCM), Daniele Bennati (Saxo-Tinkoff), Julien Simon (Sojasun) and J-J Rojas (Movistar). Some call the green jersey “the sprinter’s jersey” but strictly-speaking it’s the points jersey. However given the points for a flat stage are double those of a mountain finish it means Chris Froome or Nairo Quintana would have to win every mountain stage and time trial just to be in contention. Therefore the green jersey in the Tour is unlike the red points competition in the Giro or the Vuelta’s green jersey where a GC contender or a climber can be in contention during the final week. There’s only one per stage. With its hoardings, gantry, crowds and fixed TV camera the intermediate sprint in the Tour can look more impressive than the finish of many another pro race. We will see riders sprinting if points are available but often a break will go and mop up the points. Sprinting can be risky given the speed and tension. A flick here and a rider loses position and therefore points. Crashes are common, at best the rider gets up and makes it to the finish but cannot score points, at worst they can leave the race for good. So all the above scenarios need to be discounted for the dangers involved. Cavendish does seem to defy the odds but cannot be immune. Beaucoup sprint finishes and few mid-mountain days mean the balance is tilted away from Peter Sagan towards a pure sprinter like Mark Cavendish but the British champion will find many rivals in the sprint every day. A spill or a commissaire could change the maths for green. Rather than see the race as a duel between two riders the only certainty is that the Tour de France sees nearly all the best sprinters in competition together. I think we’ll see a similar scenario to last year with three or four sprinters winning a couple/few stages each..
…if sprint victories are spread between Kittel, Cav, Greipel etc… then Sagan will come out good. But if Cavendish wins 5 flat stages then he scores 5x45pts ! Difficult to beat. Fascinating overview. Sounds like Kittel is the real dark horse here, right? Faster than Cavendish recently, add to that the fact that there will more fast, flat finishes than last year…. Cav always delivers when it matters most, Kittel beat him at Ster ZLM but this will be different. I see around 5 stages for Cav and maybe one each for Greipel and Kittel. Agree with Luke on this one. Cav is going to creme the opposition. Mind you, how are the legs after the Giro? As with last year he’ll be fine all he lacked then was a dedicated lead out; we won’t see him picking up water bottles from the car this time around. Has anybody considered Sagan for the Polka dot jersey? Possible, but surely stage wins are his goal and Cannondale have a team focused on him for that purpose and allegedly the green jersey. Be an interesting affair for sure potentially more so than the GC as Sky dominate as they did last year. This year the Brits clean up yellow and green I say. and after winning the British championship the legs look fine. Cavendish in a breakaway!!? The competition was non-existant, it was always going to be those guys out front. From the side of the road he looked very good though, I gave him no chance on that course, I thought Millar was a shoe-in. Remember, it’s about Cav’s kick, not his top speed, that’s why a train works so well for him. To beat him you need to go early, hit top speed and hold it, but this means sacrificing your wind-break and possibly resulting in a slower sprint. 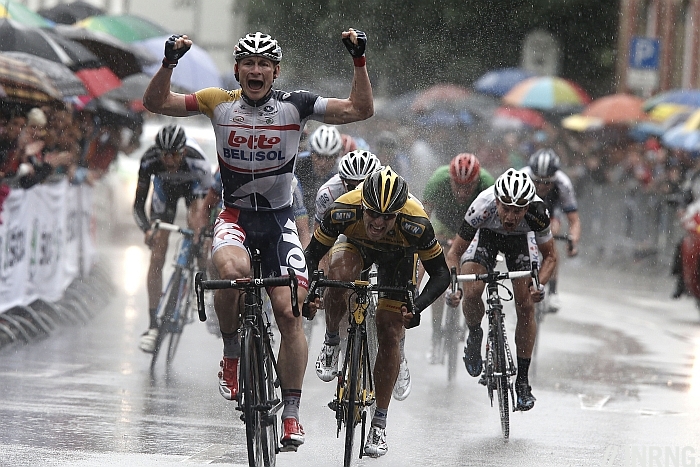 If Steegmans drops Cav off at his top speed close to the front I can only see Greipel competing. Not even a mention of Farrar? Ouch. The latest gossip is that he won’t be riding. I started the piece with him in the list but chopped it. It would make sense as he’s been very poor for over a year, but on the other hand he’d surely pick up a decent haul of WT points with top 10 finishes, I’d have though. Only WT points for top 5 on a stage (20-10-6-4-2). Farrar is years removed from his best results, which were rarely enough even then. Freddie Rodriguez and J.J. Haedo have done well after leaving Europe and racing the Americas… just sayin’. Farrar does not deserve a mention IMO. He has rarely shown the goods at the Tour, iirc he only has a single individual stage win there. Agreed, but of course we have to consider the effect of crashes in the first week as well. I suspect that we will lose a few of the 2nd and 3rd tier fastmen to nervous peloton crashes in Corsica. Its the Tour, cats have twitchy legs, the stakes are high and everyone wants to be “on the front”. Very true and I’m worried about these roads. Anywhere in France can have its dangers but a lot of Corsica has wild roads. Things do calm down for each of the stage finishes as they approach bigger towns/cities but there could be damage. Roger that Mr Ring, and while I *seriously* respect your expertise I am CONVINCED that NO breakaways will be allowed to stay away on stages 1-3 and finish towns notwithstanding, the peloton will not be anywhere close to “calm” when the peloton comes thundering down to the finish… 🙂 Why? Stage 1 will reward the winning sprinter with the MJ- a rare opportunity. That is essentially an explosion of your local blood bank and butcher store over shark infested waters, no? Nope, I think that stages 1-3 will be like the first lap at Spa where you have some highly motivated F1 drivers on full tanks, fresh tyres and DETERMINED to get into position before Eau Rouge- You know that someone will either lose position, a front wing or the entire race. I don’t understand watts etc, but I’m guessing this is rather high? Shows he’s capable of doing it differently. I give him 4 stages and the green in July. 371 NP for 4.5 hrs!!!! I can do 297 for 20 mins then fall off my bike in a pile, gasping for air and desperately trying to not vomit. 371 for 4,5hrs for a 69kg rider. I cant remember seeing watts like this ever. Given the fact that handfull of top pros have ANP sub 5,5w/kg – definitely not Cav as a sprinter. Kittel was once a top rate TT racer. When he won four of seven stages in the 2011 Tour of Poland, he was a different rider. The 1t4i coaches have focused him on sprint training and he seems to have lost something. Maybe he is not able to start from as far out, or he is already on the rivet from the run in, but he looks raged when he takes a win these days. Argos has put everything on these two young guys. Will they make enough points to stay in the big league? I am particularly looking forward to the sprint battles between Omega Pharma- Quickstep’s Mark Cavendish and Lotto-Belisol’s André Greipel, currently the dominant sprinters in the peleton. The respective merit of the trains and tactics employed by the two Belgian trade teams will be a fiercely debated talking point in the first week of the Tour. My thoughts are that Lotto’s will be more effectively organised for ‘the Gorilla’, especially marshalled by the Dane Adam Hansen, while ‘the Manx Missile’ is a more spontaneous sprinter with a faster flat out speed, better equipped to cope with the out and out chaos of a Tour De France finish. It will be close, controversial and certainly fascinating. This is a clash between two fine cyclists, who are rightly proud of wearing possibly similar national jerseys as champion cyclists of Germany and Great Britain. I see this as a race between two men of different nationalities aiming to cycle very fast across a finish line. This is not Bayern v Chelsea, or even FC Hansa Rostock v Douglas Royal F.C. Sure Phil and Paul’s commentary is maybe necessarily Anglo centric as for many this is the entry point to watching the Tour for viewers in the UK, US, Australia and New Zealand. However, part of the deeper enjoyment of becoming a cycling enthusiast is the celebration of individual achievement and character, irrespective of nationality or even current employer. It is possible to support both Greipel and Cavendish, or to cheer if Euskatel beats Team Sky in a team time trial. With Wiggo’s win bringing in new UK cycling fans, and in turn new UK media outlets, I hope that the sports reporting reflect and celebrate cycling’s admirable cultural diversity. PS: I think Sagan will use the double Alpe D’Huez climbs to try and eliminate both Greipel and Cavendish so he would be my choice of winner for the Green jersey and the Alpe D’Huez Stage. Not sure the ASO would allow a time elimination though. Thankfully, this is not football at all. Hansen may be a Danish name, but I’m pretty sure Adam Hansen is not Danish. This post has to be trolling. Have to be honest, most of this post did not make sense! I’m a little doubtful that Cav will dominate the sprints as commonly supposed. Although much is made of his dedicated team at OPQS, its more adhoc then the well-oiled trains of Lotto & Argos Shimano and I think the relatively weak sprint opposition at the Giro papered over this somewhat. So I agree with those above who expect the sprint victories to be spread around. Sagan seems even better then in 2012 – his stage wins at Tirreno were jaw dropping in their variety (beating Cav and Greipel in a bunch finish, besting Nibali on the day of the infamous 27% ramp). I guess we don’t know if he’s held onto that form, but I still favour the Slovak for green on the basis that he has more opportunities to bag points. Very happy to be wrong – love the little marvel that is the Manx Missile! You’re going to be a happy man! Wow, great piece INRNG! I did not know that about the sprint points differing between flat and hilly stages. I think you’re right that it makes it harder for Sagan to win green. The one fly in the ointment is if Cav doesn’t win all the flat stages, and the wins are more spread around amongst the other sprinters. I think that would tilt the balance towards Sagan. Also, great comments! So nice to read thoughts of such a knowledgeable group! On to the Tour! One thing that I haven’t seen talked about much is the possibility that Cav was ‘sandbagging’ at the Ster ZLM tour. Why try to dominate a comparatively minor race and have OPQS be forced to do all the work in Le Tour? Sprint at 80% rather than 100% and allow Kittel, Bos etc to take a win and maybe we’ll see Argos-Shimano and Belkin working to bring the breaks back! It wouldn’t be the first time. If you read his autobiography, in the run up to when he won Milan San Remo, he deliberately failed to get over a mountain at the race before (sorry, I’ve forgotten which one it was) so that other teams wouldn’t try to drop him on it. “… applying the brown chamois cream”? That’s the last time I read INRNG over breakfast. Maybe born on the Gold Coast, but lives/lived in Cairns, North Queensland. I went to high school with him. Will Vacansoleil be riding for Boy or Danny in the sprints? They seem to make quite a point of bringing the youngest one, but I see you mentioned Boy here..
I’m more interested in who will contest the KOM. I hope it will be every climber. Cav at the giro , 5 available stages , 5 won plus the points jersey in a real hard grand tour perhaps harder than TDF will be. When it matters he delivers. The opposition goes up a level or two. Instead of Bouhanni and Viviani, he’s got Greipel and Kittel. The sprint contests should be good although it means many stages with the action packed into the last 90 seconds. Okay, won’t happen. But Kittel should be able to beat Cav. Do sprinters winning a stage slpit the prize pot with the train that got them there? Prize money is shared in the team but it’s common for a sprinter to go beyond this. They’ll often buy team mates something valuable as a gift to say thanks, typically a watch. I agree with you, Cavendish is my bet for the green jersey. However if there is a break I can’t see him being in it. All things considered, Cavendish is indeed the favourite. It remains to be seen to what extent Sagan & Cannondale will be willing to contest the jersey. If they do, they must harden the race in every stage with a minimal chance to drop Cavendish, not only before final sprints, but also before intermediate ones, which can make the race incredibly fast and tough. They should even aim at leaving Cav (and Greipel) outside the time-cut on mountain stages. Not a fan of the TdF skewing the points competition towards the sprinters with the weighted points and only one intermediate sprint. I like the Giro and Vuelta version better with equal points. Guys like Paulo Bettini and Thor Husholvd have won by getting into the breaks for intermediate sprint points or finishing consistently high everyday. Under this system you will never see riders like EBH or Albasini take home the Green. I do like Sagans chances though. If he can takes points on days in the mountains and finish high on the flatter stages he should wear green for the last week of the Tour. ‘mon the Cav! Seriously hope Cavendish takes green jersey, Sagan is a headline waiting to be written. This could be a very close battle that’ll come down to the last day. I reckon it will be bitter-sweet for Cavendish – winning on the Champs Elysee but not winning green as Sagan will pick up the point he needs to secure it. I personally like riders like Sagan who can win anywhere rather than pure sprinters. Sprinting was always who can avoid working the most rather than positive, attacking racing throughout the race. Ha, what tripe re sprinters avoiding working, do actually watch road racing? Have you seen what sprinters go through in the mountain stages of a grand tour, stages they are entirely physically unsuitable for, so they can sprint on a later flat stage and go deep into oxygen deficit for the last 300-500 metres when all the mountain goats and tt boys are cruising on the hoods? I don’t deny that they have to work in that sense. I mean they don’t do any of the pulling on the front until the last 300 metres. BTW I do watch road racing. In fact Cavendish was 6th when I won the National GHS 10 mile Time Trial Championships. I also beat him at Pimbo in a road race, dropping him on a hump-back bridge when we were 20/21, and I was a member of the GB Junior Team, so I think I’m qualified enough to say that sprinters are lazy (most of the time) haha lol. Ok lazy is a strong word. I guess you have to have raced as an amateur to appreciate how annoying it is when there’s someone in the group not working and then does well in the sprint. As a pro, it’s expected that teams will work for you if you’re a good sprinter, as pro racing is more of a team sport, so it’s more acceptable to sit in until the last 300m. I have won races through a bunch sprint and by breaking away, and let me tell you that breaking away is much harder. Oxygen deficit for 1 minute is nothing to these guys. It doesn’t hurt at all. My feeling is that you will like Sagan a lot less when he’s revealed not to be a stag winning, physical anomaly but someone who came from the seriously murky world of Mountain Biking and miraculously turned into the best all rounder in world cycling…in the space of two years. Well that didn’t turn out quite the way we hoped, what was that word from The Thick of It…Omnishambles, yip, that sums it up. Hope all are fit and well for tomorrow although Tony Martin definitely out.